The Old Bakery and Emporium is a historic building located in downtown Austin, Texas. Their shop consists of one-of-a-kind items created by local artists from Texas, but they have never offered their products online. The goal of the project was to design a brand new e-commerce website for The Old Bakery and Emporium, based on a sample cross-section of 100 products they would offer online. The Old Bakery and Emporium has never had an e-commerce website, so one of the first things I wanted to do was explore other websites with similar product offerings to see where they were successful and where they had shortcomings. 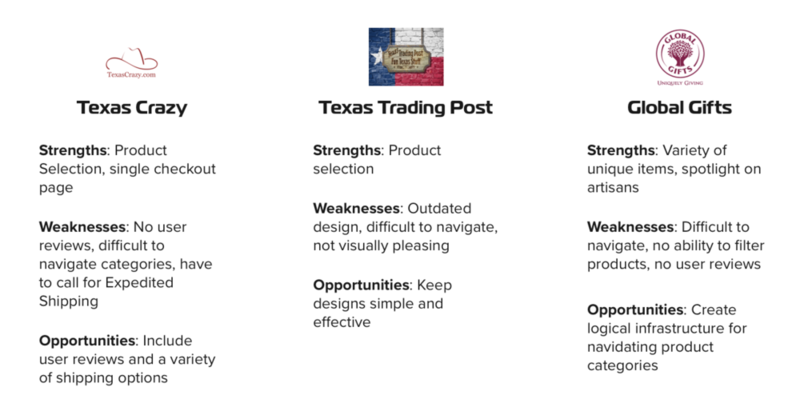 I chose to focus on Texas Crazy, Global Gifts, and Texas Trading Post. It became obvious that in order to improve over the competition, my site would need to include user reviews, a variety of shipping options, simple and effective designs, and be based on a logical infrastructure in order to navigate product categories. I came up with 30 questions about online shopping to ask my participants. The questions focused on their shopping habits, what they enjoy most about shopping online, and what their frustrations were when it came to e-commerce websites. I then interviewed 3 participants between the ages of 28 and 35 who have shopped online at a variety of sites. After my user interviews were completed, I wrote down the findings on individual Post-Its, which were color-coded to each interviewee. I then grouped the Post-Its based on similar pain points, thoughts, or desires the users had. Thanks to the findings of my user interviews, I felt confident in creating two user personas for the project. 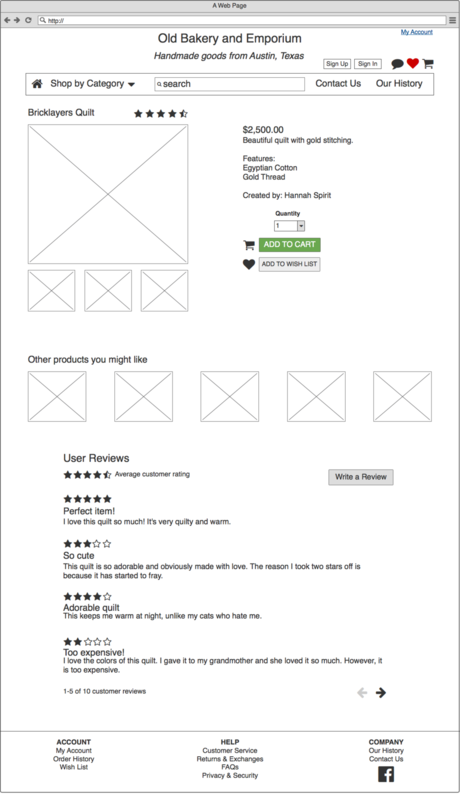 I would keep these personas in mind while designing the e-commerce site. Now that I really understood the users I was designing for, I came up with my list of features. After being supplied a sample list of 100 products that the store sells, I sorted them into categories and labeled each item with a subcategory so I could get a sense of my information architecture. 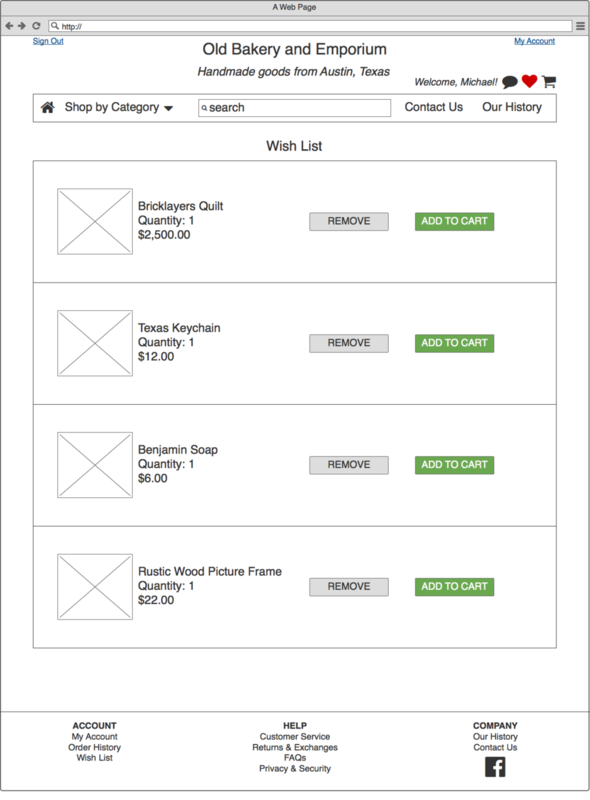 I wanted to make sure I was creating an efficient and easy experience for users by making items easy to find. Now that I knew what features I wanted to include and how to organize the products, I started sketching ideas for the website. 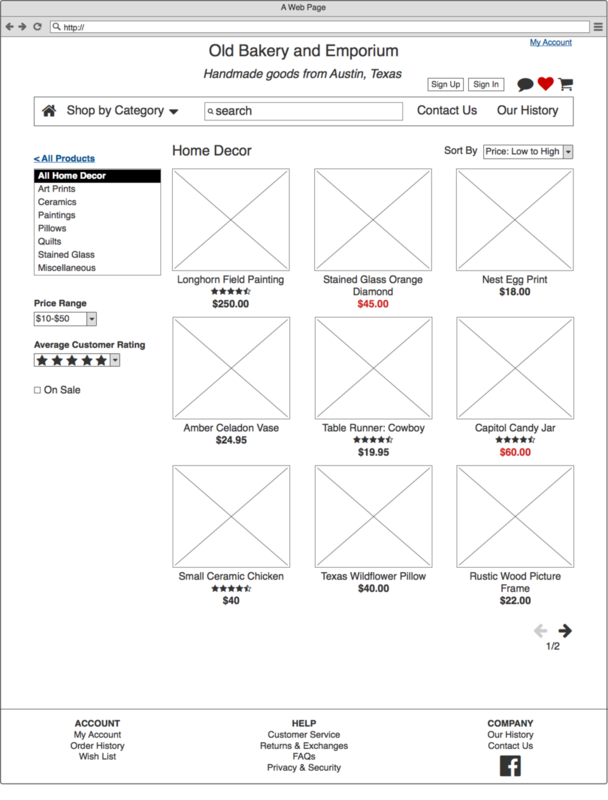 After feeling comfortable with my paper sketches, I then created wireframes in Balsamiq for all of the pages and features that I wanted to test. 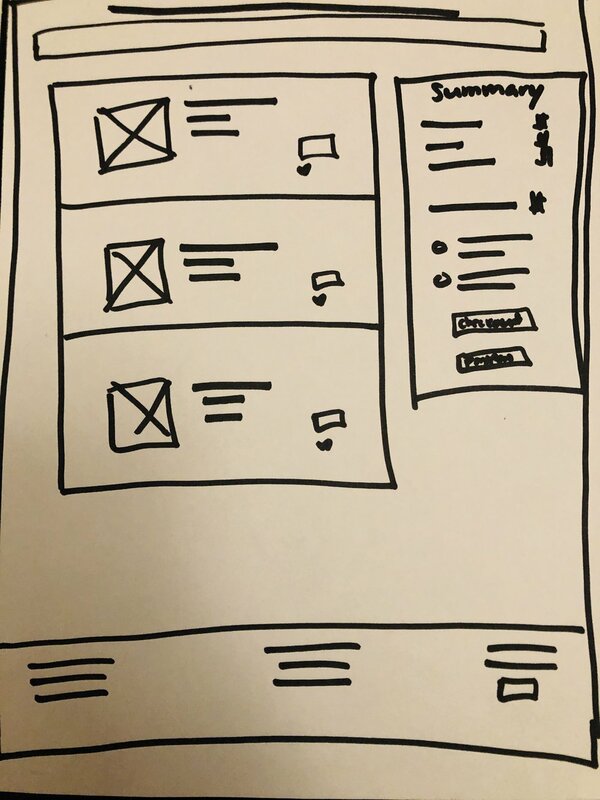 After all of the screens were in Balsamiq, I imported them into InVision to create a clickable prototype for user testing. Using the new clickable prototype in Invision, I performed usability tests. I had 3 participants between the ages of 28 and 68. Want to talk to me about this project or any of my other work?